Why should you buy a Faucet Filter? Which water faucet filter is right for you? A faucet filter provides convenient access to clean, great-tasting water, straight from the tap. These filters are installed easily and quickly, without requiring the use of tools. They attach to the faucet within minutes and have different features to suit your cooking and drinking water needs. 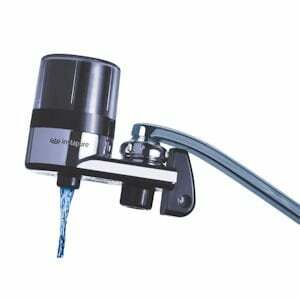 Filters Fast carries several water faucet filters from popular brands including Instapure faucet filters, PUR, Brita, GE and Culligan. Use this guide to assist you in selecting a water faucet filter for your kitchen. The Instapure Filter Faucet series includes three different faucet water filter systems, with filtration levels ranging from basic to advanced. Each replacement filter cartridge has a filter life of up to 200 gallons and should be changed every two to three months. These faucet filter systems allow you to choose between filtered and unfiltered water, extending the life of the filter. The Instapure Waterpik F2 reduces chlorine taste and odor for better tasting water and is available in white or chrome, with a clear cover. Standard replacement R2 filter cartridges are available to buy in packs of two or four. Instapure R5 and R7 replacement filter cartridges are also compatible with this system. The Instapure Waterpik F5 reduces chlorine taste and odor while also removing 99% of cysts and lead. This faucet filter is available in white and chrome with matching white or chrome covers. The standard R5 replacement filters are available to buy as single cartridges or in packs of two. R2 and R7 filter cartridges are also compatible with this filter. The Instapure Waterpik F8 is the most advanced of the three Instapure faucet filter systems. It reduces chlorine taste and odor and removes 51 contaminants, including heavy metals, 99 percent of cysts, agricultural and industrial pollutants, and turbidity. Available in white or chrome the Instapure F8 stylish, contemporary design has a base and filter unit that is 20 percent smaller than other leading brands. An auto switch automatically switches back to unfiltered water after each use, extending the life of the filter. In addition, a convenient filter change indicator light tells you when it's time to change the filter. This faucet filter system also has a power rinse feature that allows you to rinse clean pots and dishes with unfiltered water. The R7 Instapure replacement filter cartridge also fits the F2 and F5 system models. This filter reduces chlorine taste and odor, class 1 particulates, lead, lindane, asbestos and 99 percent of microbial cysts. Originally made for the F7 Instapure faucet filter system (now discontinued), the R7 replacement filter cartridge reduces more contaminants than the standard R2 and R5 replacement cartridges. All PUR faucet mount filters install easily with just one click. These filters feature a built-in electronic filter life indicator and a 360-degree swivel design to allow for more room to work. There is also the option to choose between filtered and unfiltered water with the flick of a switch. PUR faucet filters have a filter life of up to 100 gallons and should be changed approximately every two months. The 2-stage PUR faucet mount filter features two layers layers; layer one traps sediment and layer two is an activated carbon microfilter that further reduces sediment, along with chlorine taste and odor, chlorination byproducts, and agricultural and industrial pollutants. This faucet filter system features three color options - white, stainless and chrome. 2-stage PUR filter replacement cartridges are sold in packs of two. The 3-stage PUR faucet water filter has three layers for more advanced filtration. Layer one traps sediment; layer 2 reduces contaminants, including lead, mercury, dirt, chlorine taste and odor, and 99.9 percent of microbial cysts; and layer 3 filters the water over natural minerals to add a crisp, refreshing taste. This faucet filter system also features three color options - white, stainless and chrome. Replacement filter cartridges are sold in packs of 1, 2, 3, 4 or 6. The PUR flavor options faucet water filter is a 3-stage filter that allows you to add grape, strawberry, raspberry or lemon flavor to your water with the push of a button. Brita faucet mount filters are available in two different models. The basic filtration system (Brita OPFF-100) has a standard electronic filter life indicator with replacement filters available in white or chrome for a customizable look (See Fig. 1). The Brita On-Tap System with Advanced Features (Brita FF-100) comes in three color finishes - white on white, chrome on white, or chrome on black - and also has a standard filter life indicator plus a convenient spray feature that gives you control over three flow options - filtered water, spray or stream (See Fig. 2). The Brita On-Tap Filters have a filter life of 100 gallons and should be changed every two months. Both models reduce chlorine, lead, sediment, dirt, cysts, turbidity and many other water contaminants. The GE faucet filter system (GXFM07HBL) reduces many contaminants, including chlorine taste and odor; cysts, atrazine, asbestos, benzene, lindane, turbidity, lead and mercury. This system features an LED filter change indicator light, along with an option for "filtered spray" flow which makes cleaning fruits and vegetables easier. This filter is available in white or chrome and has a filter life of up to 100 gallons. The OmniFilter F1 series reduces rust, sediment and chlorine taste and odor. This faucet mount filter features a filter change indicator dial. It lasts for up to 200 gallons, and should be replaced every three months. The Culligan faucet filter FM-15A removes chlorine taste and odor, sediment, turbidity, atrazine, lindane, class 1 particulates, cryptosporidium and giardia cysts. Features include a cartridge change reminder sticker and a diverter valve that allows you to choose between filtered and unfiltered water. This filter can be installed in right or left hand orientation and has a filter life of up to 200 gallons. The Instapure F2 Faucet Filter is one of the more affordable water faucet filters on the market. If you're only looking to remove the taste and odor of chlorine, then the Instapure F2 is a good choice. The PUR FM9400B Faucet Filter removes more than just the taste and odor of chlorine: it also reduces Mercury and 99.9% of microbial cysts. The Culligan Faucet Filter will reduce far more contaminants than most faucet filters, and it has a respectable filter life of 200 gallons. It is a great bargain at $19.99. The only downside to this faucet filter is looks, but that is subjective. "Instapure F5 Faucet Filter Named 'Best Buy'"